Get a fantastic Booming Games free spins bonus today at Bitstarz casino and play the brand new Wild Jester slot. 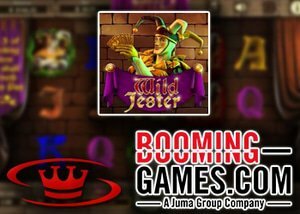 Booming Games has introduced their new Wild Jester slot and we have a fantastic free spins bonus for all our readers to claim today. This new video slot is a 5 reel, 25 payline title that is packed full of great features. Play like royalty and gather your gold in this stunning graphical game that includes fantastic 3D animations that help it come to life on your screen. Below you will find details on the new Wild Jester slot and how to claim your free spins bonus. This is a 5 reel, 25 payline video slot that comes with great bonus features. There is a 2-way pay feature when you spin three or more joking jesters as well as a free spins bonus round. The suit of armor symbol is the one to watch for and when you get three or more of these you trigger the free spins bonus and 10 free games are yours. There is also a gamble feature and wild reels as well as two other special bonuses to watch out for as you spin the reels. Get three or more jesters and you trigger the 2-way pay feature. When this happens the feature is activated for 10 spins and all winnings will be paid out for any combinations you make from left to right, and right to left. There's lots more fun and entertainment to be had in this new Booming Games slot and below you can view the demo video that has been released that will show you all about the mega wins that are up for grabs. If the new Wild Jester slot sounds like fun to you, why not head over to Bitstarz casino today where you can claim a 20 free spins no deposit bonus when you sign up as a real money player. That's not all, the free spins no deposit bonus is part of the welcome package at Bitstarz and all new money players receive $500 free plus 200 free spins over their first four deposits at the casino. After you've used your 20 free spins you can make your first deposit and get a 100% bonus up to $100 or 1BTC. You also get 180 free spins that you can use on Boomanji, Fruit Zen, or Starburst. You get 20 free spins with your deposit and a further 20 each day for 9 days. When you make your second deposit you can claim a 50% match bonus up to $100 or 1BTC. Your third deposit will get you a 50% match bonus up to $200 or 2BTC, and your fourth deposit gets you another 100% match bonus up to $100 or 1BTC. Bitstarz casino is the number one bitcoin gambling site and the bonuses don't end with the welcome offer. Every Monday real money players get a 50% reload bonus up to $50 or 250mBTC. Every Wednesday it's about free spins and all you have to do is make a deposit and wager the same amount to receive free spins the following day. Players can get up to 80 free spins. Visit Bitstars today to claim your Booming Games free spins bonus and play the new Wild Jester slot.